Weren’t measles outbreaks a thing of the past? Montreal, January 16, 2012 – “Measles --an infection of the respiratory system whose symptoms include fever, cough, runny nose, red eyes and a generalized rash -- is known as the most contagious of infectious diseases,” says Dr. Caroline Quach, of The Montreal Children’s Hospital, MUHC. “One infected measles patient has the ability to infect roughly 12 to 18 others who are not protected against the disease, in contrast with smallpox, in which 5 to 7 people can be infected or the pandemic flu virus, which can affect approximately 2 people.” (Dr. Quach will give a talk on the resurgence of measles in the upcoming MCH webinar series. For more information see below). “In a hospital setting, such a contagious disease can be challenging to contain,” says Dr. Quach. “For example, if you have an infected patient in the emergency room, who then leaves, and a new patient enters this same area – with the same pocket of air – even thirty minutes later, this new patient will definitely be exposed to the disease even if they haven’t been in direct contact with the infected person.” While this is merely a theoretical situation, Dr. Quach explains, it could in fact happen given the highly contagious nature of measles. Why the resurgence right now? While measles was once almost unheard of in North America, it never completely went away. Last year, there were thousands of cases of measles, though they were mostly limited to countries where children were not vaccinated or were incompletely vaccinated. Still, a recent resurgence of the disease has been observed throughout Europe over the past year, and more particularly in France, where some young children have not been immunized sufficiently against the disease. The Quebec Public Health Association has determined that measles likely made its way to this province in the last year through individuals vacationing in Europe, who contracted the disease while on European soil. When these individuals came home, they developed and subsequently transmitted the disease here upon their return. 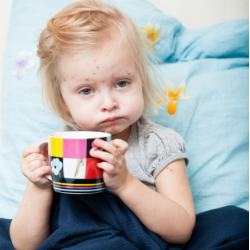 As a result, there were an estimated 751 measles cases in Quebec in 2011. Part of the reason the number of new cases is so high is attributed to a 1998 study which appeared in the scientific journal The Lancet, which falsely alleged that the measles (MMR) vaccine was linked to autism spectrum disorders in children. The publication of this study led many parents in Europe and elsewhere to forego vaccinating their children against measles. As Dr. Quach explains, when immunization rates drop below the rates needed to prevent an epidemic of measles, the incidence of disease contractions greatly increases, as we are now seeing in North America and throughout Europe. Dr. Quach will be giving a talk on measles during the 2012 edition of Kids’ Health 101 Webinars. Registration has begun and space is limited. Our free webinars are offered in English starting March 13 and in French starting January 25th. Interested parents and caregivers can register by emailing info@thechildren.com or can obtain more information by calling 514-412-4307.